An Open letter to Recruiters, talent acquisition teams, hiring managers, and anyone who has to hire anyone ever! A new era of recruiting is upon us. Despite your best efforts, finding a steady stream of high quality candidates to fuel your organizations growth is incredibly hard. 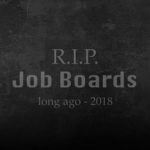 Job boards do not work the way they used to. Fancy new features like “Direct Apply” that were supposed to streamline the application process instead just floods you with a high volume of poor quality candidates. Your Application Tracking Systems (ATS) are stretched trying to do too many things, and not doing any of those things well. And a new generation of job seekers born of the gig-economy don’t think about employment and job search in the same way as the others that have gone before. Into this chaos comes Google for Jobs. Google for Jobs launched just over one year ago in the US, and is now available across North America, Latin America, Sub-Saharan Africa, the UK, Spain, India, and Singapore. Hundreds of millions of job searches launch on Google each and every day. Previously those searches would take the job seeker to a job board, or maybe even your website. No more. Now, the Google for Jobs search results box appears first in the search results. And yet, for at least half of you, your jobs are not even showing up on Google for Jobs. And even worse for the other half of you, Google is probably sending your prospect to a job board, to the job aggregators, maybe to your ATS branded Job page, or a dozen other places. But you know where they are not sending your prospects? Recent research has shown that 64% of candidates want to use your site to apply for a posting, and yet it’s even harder for them to get there. And I hate to break it to you, the job board doesn’t care. Your ATS doesn’t care. Google doesn’t care either. Neither does your boss.